Only five days in, I can’t stop using it. At the end of the day, you’re either an Apple fan or you aren’t, but even if you aren’t, you really can’t negate the capabilities of the new iPad Pro. After a lot of hubbabloo, drama and back and forth, I finally got my hands on the new tablet, and guys … wow. Now, when you sit back and look at it, it’s just another tablet, right? It’s not vastly different from the other iPad models. The general UI is the same, but the power, the capabilities and the tweaks and aesthetic redesign have made it far superior. I haven’t touched my laptop since getting it, and that’s saying something because I would jump back and forth between my laptop and first generation iPad Pro constantly, with pit stops to my desktop on the way out the door. For context, I’m a writer, graphic designer, digital artist, 3D artist, game developer, and traveller. So my digital needs are vast and sometimes overwhelming. The capabilities of this tablet have made it a nearly complete laptop replacement. When Photoshop CC comes to the App Store, I’m not sure I’ll have much more use for my laptop anymore other than another stay-at-home workstation to sit next to my desktop as a third monitor. So far I find it to be an 80% laptop replacement. That extra 20%? Stuff that I really need my desktop for anyway. Zbrush, Maya, After Effects, Premiere, most of the adobe products and other 3D design software. I’d never think to use a tablet for all of that stuff anyway and wouldn’t couldn’t get very far even if I wanted to. Some of it I can do on my laptop, which is why I’m keeping it and only calling the tablet an 80% replacement. So lets talk about what I love. The lack of a fingerprint button was odd for the first couple of days, but now I’m really digging the Face ID, not because it takes away the step of logging in via pushing the button so much as the privacy. Let me explain. Before, when notifications show up on your phone/tablet you would always see a preview of what it was on the screen. Message from FB messenger? The senders name and start of the message appears. Anyone who picked up your phone/tablet would be able to see who was messaging your/emailing you along with a part of what they’re saying. I never liked this, it’s why I never let people use my devices or even leave them face up where they can be seen by whoever is sitting next to me. The new iOS actually hides all of this. The notification comes up on the screen, but it’ll only say ‘one new notification from X’ and won’t pop up with the preview of the notification until it IDs my face. I LOVE that. My first iPad was the 12.9 inch. My laptop is 15 inch. My desktop is a 27 inch iMac with a 22 inch cintiq monitor, so when I decided to get the 11 inch tablet, I was terrified it would be too small for me. I don’t have the best eyesight, so bigger is always better, but I’ve been blown away. The screen is nearly edge to edge on the tablet, so there’s no huge bezel as with other models, which I quiet enjoy the aesthetic of, but it also makes me feel like I’m utilising all of the space well. It makes the screen feel bigger while taking up much less space, which my purse loves. This has also made it far more confinement to carry around and work on while I walk. Just yesterday, I was at my day job (student accomodation) and I was running room to room with my tablet filling out spreadsheets and information and taking photos and it wasn’t clumsy, clunky or too big. It fits my tiny hobbit hands perfectly, even with the keyboard case I have on it. Graceful is something I could never be with the larger tablet. It would take up my entire lap. Lots of screen space, but not convenient when out and about in any setting other than sitting at a table. The Apple keyboard was something else that made it awkward. It was nice, but it wasn’t practical for being portable. Apple could do better IMO. I got 1 full TB of storage. Sounds like a lot, but it was the one thing I wished I’d gotten when I got my laptop a few years ago. I left it at 500 and regretted it from day one. My writing files may not take up a lot of space at first glance, but in the five years since I got that laptop I’ve accumulated a few gigs of writing files. The same goes for my digital art and designs. PSD files and JPEGS and PNGS accumulate and take up a lot of space, and yes, I need them. Not to mention movies and music and Netflix downloads for travel downtime. I only had 128GB on my last tablet. I regretted that too. Having to pick and choose what I wanted/needed on my tablet for the next day in terms of files and such was a daily task that took quite a while to get setup every night . (Same for the laptop.) I had to be frugal with my space. It might sound silly, but it was stressful and infuriating. I maxed out at 1TB so now I don’t have to worry about any of that, ever. I filled this baby up the night I got it with ALL of my stuff, movies and music included. I’m set with ample room left over for more. No more alerts that there’s not room on my tablet for the new Procreate painting I’ve tried to start, or that I can’t screen record it, or that there’s not room to download this new app I need to test, etc. It’s one thing I don’t have to worry about anymore, which means it’s one less thing I stress about, and being less stressed makes me more productive. Maybe you think it’s petty, but I don’t care. Time is money, productivity breeds income, and I’m passionate about paying bills and eating food. The 1TB iPad has 6GB of RAM. The lower storage models have 4GB. Now, whether it makes a huge difference or not, I’m not entirely sure yet, but I intend to be using Photoshop CC and Lightroom quite a lot. Anyone who uses photoshop knows about layers, and how big they make your files. Well, I use A LOT of those. So the fact that the 1TB storage I wanted comes the added bonus of more ram, awesome. I haven’t been able to test the speed/capability of this tablet to one with only 4GB, but I can tell you that compared my other tablet it is miles better. I had a lot of lag and glitches with the old one, especially when I was drawing/painting. So far, with this one, nada. It’s faster than me. I haven’t gotten the Apple Pencil yet, but just painting with my fingers its been smooth and flawless. No glitch, no static and noise in my drawing, no slow lines and lag. It’s … perfect? Yeah, perfect. So far. The UI capabilities have changed with the new models/iOS of iPad (not just the 2018.) Side by side apps and floating apps have been a godsend. The side by side capabilities is one thing I actually prefer on the larger iPad, but it works fine on the small one. I’ve been making far more use of the floating tabs however. I can have my messages, or messenger, or reminders or whatever secondary app I’m using swipe on and over over my current app without having to get out and reopen etc. It’s lovely. As I said though, these features are available on the other iPads, not just the new one. I just really enjoy them and find them quite useful and productive. I’m able to switch between all of my open apps with just a swipe at the bottom of the screen. Nifty and streamlined. I like it. The new pencil also has a different feel against the screen of the tablet. With the old one if felt like you were drawing on smooth glass, which is a very strange feeling. It’s too smooth. With the new one, there’s a bit more resistance which is good. The tip of the pencil feels more rubbery, but it’s still not enough for me, which is why I’m about to instal a matte screen protector. The matte protector may damped the vibrancy of the screen a tiny bit, but it makes it feel more like you’re drawing on paper with that added resistance. I’ve heard a lot about the Paperlike protectors, but I’ve been quite happy with a cheap 5 dollar one off of eBay. They do the trick, so I don’t feel the need to spend $40 + shipping for the other one. Now, the new Apple Keyboard is very Apple, and it’s better designed than the first one IMO. It allows for two viewing angles and folds up better than the last model. That said, I don’t like it. I like the keys and they way they feel to type on but that’s The extent of it. I found a golden egg in the Lenrich Bluetooth keyboard & case. My tablet snaps in and makes it look like a little laptop the way it opens and closes. 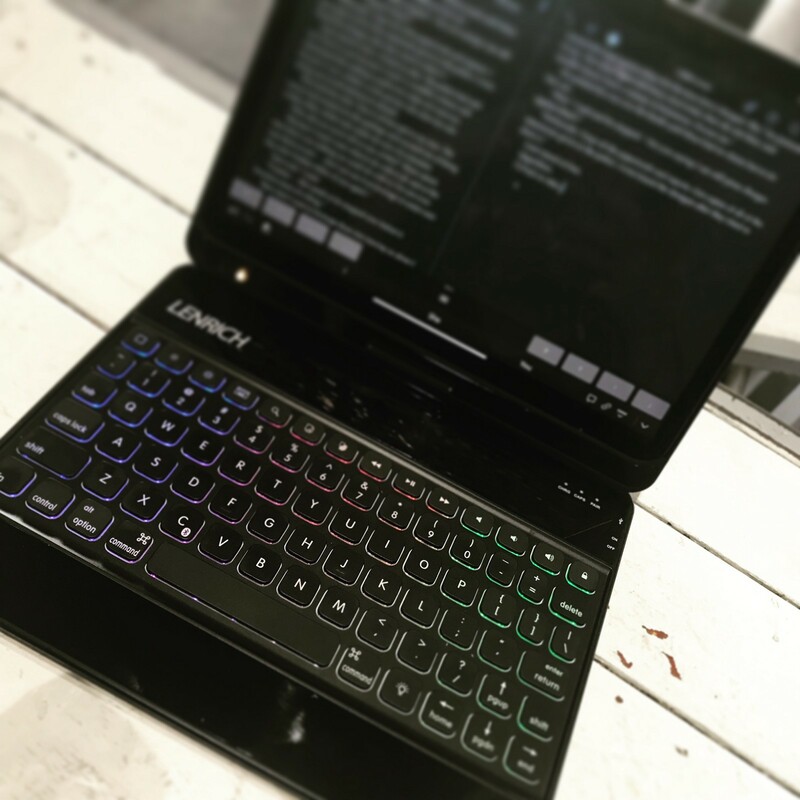 The screen swivels around so you can fold it down and then draw on it without the keyboard getting in the way and keeping it safe and well kept. It does add a bit of weight to the tablet, but the protection it gives and the folding layout and keyboard make up for that heft. It’s still lightweight. The keys themselves are nice. They’re quiet but clicky, smooth and fully backlit. The right shift key is quite small, being the same size as a normal key, but after you get used to it it’s no longer a factor. You can control volume and media from the keyboard, as you would on a normal MacBook or iMac, but you also have a series of shortcut commands that can lock your screen, take you to home screen, and open up quick search. My favourite part though? The keyboard backlights. 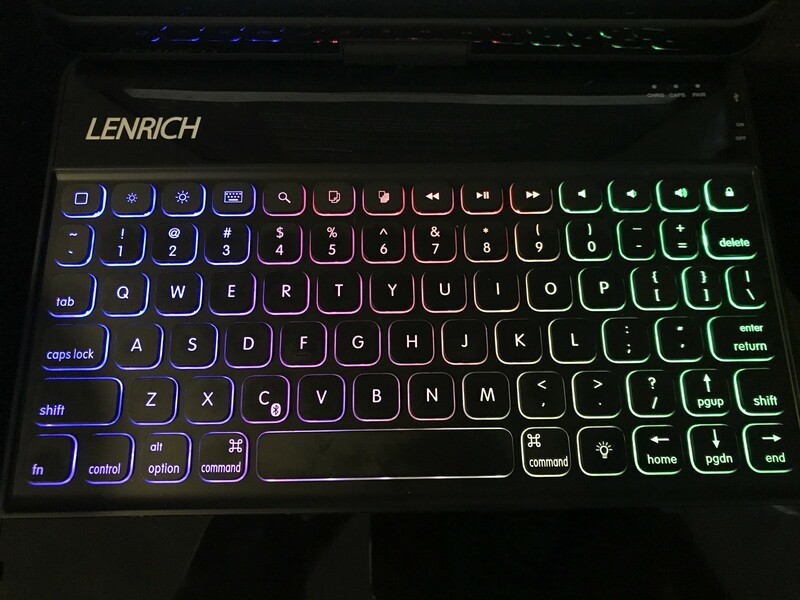 It’s an RGB light up keyboard. You can cycle through seven colours and a series of tri-colour setups. How often do you see awesome RGB backlights on anything other than big chunky mechanical keyboards? Not often enough. The USB C port will be useful no doubt when I start doing things like plugging my camera directly into the tablet and such, but the least Apple could do was include a USB C to USB A cord. I had to go out and buy a new cord just to plug my tablet into my desktop to sync it. If i had the money to buy a new fancy laptop with all the new plugin ports, I probably wouldn’t need a tablet. (That’s not actually true, I can’t draw on an apple laptop without buying more hardware to carry around.) Nonetheless, it’s highly unlikely that everyone has a new Apple laptop or desktop that has the new ports. My laptop is five years old, my desktop is four years old, I’m not likely to upgrade either one anytime soon. That’s not an economical practice, unless you’re rich. Newsflash, I’m not a top notch author yet, so no new computers for me. I’m not super disappointed with the battery life. I can get a good full day out of it, two if I’m a bit frugal, but a day of only using some spreadsheets and writing apps, I didn’t expect it to decrease so fast. Don’t get me wrong, it’s got good life, but at this point I expected a bit better. It’s good, not great. The cost is high. It’s not laptop high, but it’s high. Granted, I got a 1TB storage unit with 6GB of RAM, but I still feel it was a bit high. The cost of the pen is what really got me. $200AUD for the Apple Pencil. The last one was around $140-$170 I believe, (I got the first one). I’m aware that these are high grade products, but the steep price makes it very difficult to obtain. It its a tablet at the end of the day, not a full blown laptop. I want to be able to plug my USB drive or hard drive into this tablet and transfer files back and forth. That feature isn’t working quite yet, I do hope that they look into it in the future. The iPad Pro 2018 is still new, so there aren’t an abundance of apps generated sper soecifically for it. Yet. I have no doubt they’ll come, but a lot of my games tphat I play aren’t optimised properly for the new aspect ratios and iOS. The keyboard is fantastic, but I don’t like the material used above and below the keyboard itself. It’s a black shiny plastic that picks up every little smudge and feels too slick. It would be far superior if it was an anti smudge plastic material with texture or a fabric of some kind. The outside of the case feels nice to touch, but it does also pick up oil from your fingers and leave discoloured marked that must be cleaned constantly. It also picks up scratches and marks from being in your bag/carried around. They can be cleaned, but again, and fabric material of some kind would be superior. This concludes my five day review. I’ve used this tablet far more than I’ve used my old ones and even my laptop in the past few months. The versatility and features have made my laptop nearly redundant. Soon I believe I’ll only need this and my desktop. I’ve yet to work with the mirror feature, but when it comes to editing high-res photos I believe it’ll be quite useful, especially if I’m out at someone else’s studio and projecting to a larger screen after a shoot.